Am I ready to take the next step toward the object of my desire? Ready to brave the next choice, whatever that may be? 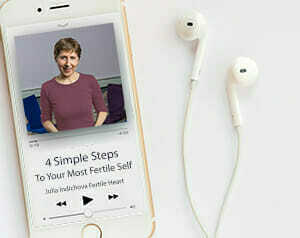 If it’s the motherhood trail I’m on, should I let go of treatment, schedule or cancel my next in vitro, choose a sperm donor, enroll in an egg donation program; deepen my relationship with the I.B.O.W. practice, investigate adoption options? In the I.B.O.W. practice we actually don’t talk much about being ready or not ready. What we ask is: with this next choice, would I be– interrupting or supporting– the gestation of my next Visionary Self? Am I choosing this next step because the contractions, the labor pains of that Visionary “pushing through the birth canal” are becoming too uncomfortable? Do I need a midwife to breathe with me through the contractions, or will this gestation of my next unborn Self lead to yet another miscarriage? When the gestation is complete and that next Self is spontaneously born I don’t need to ask whether or not I’m ready. The newly born Visionary simply walks out of the Orphanage and spontaneously takes the next step in the direction of her desire. And yes, sometimes we need to birth the same Visionary over and over again. What then is the question of the day? So once again, the questions we get to ask today and every day are: which inconceivably fertile next Self is in gestation? How do I nurture her toward a full term pregnancy? What nutrients is she lacking (does she need)? Do I dare to ask for what I need in my relationships with others to usher in this new birth? Also – I shared this post with my husband. (And held my breath.) I got back the most open, heartwarming response. He said he was feeling a lot of the same things and would love to explore them with me. Very validating for my visionary self. We shall see where we go from here. Can’t make the call on the 15th, working on the 20th. So I have been working with “Soul on Fire” (Body Truth) and focusing on a new orphan(s) area for me. Not that it wasn’t always there. But I feel like I’m tapping into it in a different and genuine way. When it comes to sexuality (it’s hard for me to even type that word), I think there are several orphans at play. There is the scared little Catholic school girl that always said no to boys (even though she deeply wanted to say yes) and their advances because she was afraid of (fill in the blank). Getting pregnant? Being taken advantage of? Letting it go too far? Having it feel good? That sense of being a good girl that says no and stop. Looking back, I wish I had been a little less hung up and a little more willing to open myself to experience. The there is the orphan that, even though I’m happily married and engaged in a sexual relationship, feels a little hamstrung by my general sexual inexperience. This one is harder to write about. The inexperience orphan. This is the grown up good girl that’s still not really grown up. That has been with one man her entire life sexually. That, notwithstanding their beautiful relationship and closeness, still has pockets of unexplored fantasies and desires that were never really worked through. Because she was so busy being a good girl when she was younger. And then after that, spent years on birth control trying not to get pregnant. Because it wasn’t the right time and she wasn’t ready. This orphan is embarrassed at her inexperience, but at the same time very curious, still in a teenage like way. She wants to be free to express her visionary self and act, speak, and feel in ways that she hasn’t allowed herself to before. That she’s afraid might make her look silly or reveal her inexperience. That she is afraid her husband might be shocked by or disapprove of. The visionary underneath is tired of the vanilla. And the suppression and repression. She wants to feel like and to be made to feel like a woman. In all ways. Even if that means starting with baby steps that go all the way back to the place where that teenage no saying orphan is hiding. So this is where my work is concentrated right now. In exploring this aspect of my vulnerability. And the flush faced, racing pulse feelings that it brings on when I think and type about it. It’s like I’ve spent my whole life saying no and being afraid to get pregnant. And I want desperately to get to a place where I can let go, say yes, and meet my child. Such a fabulous topic, Warrior Beagle, for our next Visionary Mamas call! How wonderful that Soul on Fire allowed this beautiful Orphan to finally speak and come out of hiding. Now comes the fun part of giving those fantasies full permission to juice up your baby making. ( In more ways than one) Can’t wait to explore this on the call. I’ll also be touching on this subject in the free call on Wednesday night, in case you and your husband want to call in. Awesome! You’ve just given the title of this blog and whole new meaning. :) These new names really work, don’t they? In someways I could connect with what you have written. Back in our culture the whole concept of dating is kind of a BIG NO NO. So i have no qualms there. But I could instantly get connected with some of the things that you mentioned post marriage. How beautifully written and so open. I feel you have touched a nerve for me too. I was always the goodie goodie, rarely spoke up, rarely alluded to my most feminine sexiness and still don’t, yet inside she is definitely there. And lately I have definitely been feeling down trodden, unadventurous, and old before my time. Perhaps there is a great deal of embarrassment and hesitation there about this topic, actually, I know there is. I don’t really feel I was ever taught what or how to be a woman. Like you, my entire sexual history is with one man. He’s very open and much more giving than I am. I also spent 14years desperately trying to avoid getting pregnant. I just need to let it all go, unleash the wild woman within, I have a feeling I’m REALLY GOING TO LIKE HER! Thank you MiraculousLife. This is a website I shall really enjoy exploring. Thank you. I shall really enjoy exploring this web-site. So I had something incredible happen today with a prompt from one of my healers. Something that is perhaps even a miracle. I struggled as to whether to post it here or on the miracle card blog. But I’m putting it here, as I think it cuts to the core of what I need to move to the next level. My fertility doctor today pointed out that we had become “experts” after our nearly 4 years of treatment. And it struck me that maybe that in and of itself is one of the reasons I’ve sort of become stuck. For all intents and purposes, I suppose we’ve found comfort in this place. Where I know what comes next with treatments and protocols. And what is good and bad. It’s almost as if I’m afraid to leave. Because pregnancy and parent hood are places that are totally unfamiliar. And in answering this question, I started to repeat some of the things I had thought or said back then. I’m afraid I’m a mess. I’m afraid I will get fat and not be able to work out. Im afraid I can’t do this without my mom. I’m afraid I will be trapped. None of these, however, really resonated. I stayed with it for a moment. And here is what I came up with. The very orphan I’ve been working a lot with recently. I’m afraid to get pregnant because…. I’m afraid I will LOSE CONTROL of my life. Yep. That is my worst fear. That I will not be in control. Of every little thing. Like the orphan likes to be. When in reality, right now, everything is out of control. I have no control over this process and when this baby decides he/she is ready to appear in my life. And I thought this was an amazing revelation. The other thing I wanted to share is that I was looking back at the Triumph OVer Despair forum. And somewhere in it I was reading about the fact that what made the difference for someone was their willingness (to finally) own their longing. To accept it and the fact that it’s coming to fruition will turn everything on its head. Hello again control orphan. I am ready to own this longing. That I know has been there since the year we got engaged in Aruba and I blurted out to my husband that I wanted to make babies with him, when we were on a sunset cruise. That pure feeling of “I want this so deeply.” Regardless of what it will do to my life. I am ready to shine this light on my control orphan and own the longing. I’m really struggling with ‘control’ at the moment. I have being so determined to do everything right – but what is that? What is doing everything right? I was working in my fruit patch today, picking off the raspberries and thinking what an amazing crop this year. Then I remembered a few weeks back deciding to literally hack away all the old branches, the weeds and really thin the growth. The thick forest was literally strangling the plants own ability to produce fruit. This is how I feel right now. Cluttered and suffocating under my own schedule, and my rigid expectations to achieve the perfect treatment plan, and I am desperately aware of being in need of simplicity. The fruit I picked this morning is a miracle blessing born out water, nourishment and tender loving care. My ‘v’ wants this to be all I need. But I really felt this was where I was at last year, so perhaps this visionary does need to be born again. I e-mailed my fertility clinic yesterday, a new clinic I’d visited only a few months ago and told them I was putting my monitoring on hold and cancelling my next scheduled appointment. I thought I’d feel a huge amount of relief afterwards, in fact that wasn’t the case but it was right. I guess my ‘o’ is still shadowing me at the moment. To really give in would be for me to go on my holiday next week and completely forget about the rules, the monitoring, ovulation and pregnancy. And help strengthen my ‘v’ with good food, sunshine and sleep and some really beautiful coastal walks. Pineapple. I feel everything you are saying. And your vacation plans sound delightful. I hope you are able to let it all go, have a couple cocktails, and enjoy yourself. I’m beginning to realise that my feelings around control are often behaviour rooted in my ‘o’ of fear and distrust. I can’t control what I’m living with and ultimately I’m afraid of what I don’t like to hear or wish to experience. I was right to cancel my clinic appointment and when I returned, having spent the week working with ‘Speak your peace’, and ‘Lifting the Burden’, I felt comfortable with contacting the clinic again. I do this tentatively with the acceptance that they are not there to hurt me intentionally and at any moment I can, as I’ve exercised before, take my leave of their advice or treatments. They are another resource which I now feel ready to explore a little further. WB – I realized the exact same thing couple of months back. And it became clear while doing fork in the road. I could feel the comfort of walking the natural pregnancy route because there was no pressure,it really didn’t matter to me how the road was (long, twists etc) as I felt I was in my comfort zone. Thinking of any other route was risky at that point. Ok. So I’ve written about this before. But after this pAst Friday night, I’m convinced that it’s the one thing I truly need on this journey with consistency. I had a work happy hour on Friday (had some cocktails for FFs birthday – woot woot) and it just felt so incredibly good to feel social and normal and have fun. And talk with people. I stayed out too late, came home happy, and have had 4 dreams this weekend, which is more than I’ve had in the preceding 4 weeks. I think keeping this social side of me present makes my heart feel very open. And nourishes me. Just thought I’d share. During last month, I’ve been working on trying to get back on the track of OVUM work. My last IVF was a failure and I felt that it was time to take a break, but now I am back, stronger than before and also more mature . I am working on birthing the new ME, who gives more time for her body and mind. I am closing the working day the latest at 6, began to exercise 3 times a week, never let go juicing and eating green and of course Imagery. These are the nutrients that I am giving to my body, the one with exercising was lacking completely. I have a strong orphan who says that my ex-husband will attract my only son to live with him, because he is already working on it and a second child will make my life harder in this way. So, my relationship with him is disastrous for years and can’t be reestablished even I’m trying since 15 years. I’m doing “Cutting the cord” to help my visionary get stronger. My partner is totally standing by me, since 10 years, I feel so safe and understood. Over the past few weeks I have also worked on recentering myself and my practice. I think the visionary self which I am gestating is one who is confident in herself and in her journey. I think that this journey sometimes becomes long and challenging and I have lost sight on how much I continue to grow. I believe I need more time for nurturing my own body child through movement and exercise. Exercise used to be such a huge part of my life before I had my daughter (almost 5 years ago) and I haven’t really found good balance to bring that back into my life in a consistent way. Another nutrient is support I think asking for support from my husband can be hard for me so this is also important for me. In the past few weeks I have had an opportunity to deepen my faith in my own spiritual tradition through prayer and volunteer opportunities. I think that this has brought me some peace and I’m thankful for this journey to have brought me here. Tanks for adding few critical points yday- realizing how much we are growing in this journey is often neglected by me. Another thing I would like my husband to keep pointing is if I am spiraling into a control freak. I won’t know at times & it becomes easy for him to see that behavior & bring it to my attention. Yday as Julia repeated about surrender, I just felt like a big stone was lifted off my chest. Sonya – I am not sure if you are checking this blog. But I wanted to THANK YOU A MILLION !! Mh. The control freak orphan is my personal favorite. I had Very intense run in with her this week. It seems as if the more everything feels out of control, the more she kicks in and starts to bite down and clench onto whatever she can grab hold of. She was pretty out of control this week. Makes me feel not so alone to hear you say what you did. Big hug. Don’t feel bad, guys. I am right there with you. I just had my mom’s funeral on Tuesday, but what do you think I”m doing? Beating myself up for not eating perfectly or exercising, AND trying to control my ovulation/figure out why I didn’t ovulate/how I’m going to do IVF. I’m not even grieving properly! I’m obsessing about my ovulation. ARG!! I really, really want to just let it all go and just float. I’m really worn out from every journey I’m on, and yet I won’t let go of the controls. Makes no sense. Our beautiful FF, my heart is with you through this time of mourning, I hope you’ll join our circle when you’re ready, I and our fertilehearted sisterhood, we’re here for you. The call gives us a more direct way to offer support than this forum. And, when and if you can, I wonder if you would share with us one sweet memory of spending time with your mom at any stage of your life. No pressure, just a gentle invitation. Thank you for sharing so honestly Mh. My control orphan very often has similar tantrums and outbursts. I could have written your post about the call. Wow. That just really clicked on my brain. I had for a while started to step away from FH. Because I kept feeling overwhelmed that I couldn’t do enough and should be doing more. And as I started coming back, I was remembering the advice that Julia gave on one of the calls to FF….to do just one thing every day. And your statement is right along these lines. Do just this one thing. Focus here. So thank you Mh for the reinforcement. I totally understand the overwhelming feeling Bailey. I had such kind of overwhelming moments, especially from the time i decided to embark on the donor road. I felt like I have a check list, a never ending check list, and i need to check off all the things. Sometimes I felt like i am not ready because there are so many things in my check list I need to take care of. But actually speaking this checklist of mine will never exhaust, I will come with tons of to dos before my Orphan feels like its really ready and it never feels that way, as her checklist keeps growing. I just felt like a headless chicken running hither-thither to get things in place and to do all that I can to get ready. Even when I read Heather’s pregnancy note, “while my V was dancing in joy, my orphan felt compelled to ask what Heather did and as Heather gave the list, my orphan was like you dont do this, this this….see what all she did, come on add these to your list, time is running out…..”. That’s when I felt so vexed with this sort of attitude. forget about the baby, I felt I am becoming a lunatic and I could feel my resistance against the life force. That is when my V became even more stronger to bow to what is and learn to surrender. I dropped everything and started picking what I felt like, not for the baby but for my own self, to maintain my sanity. Feels at peace. Baby will come when she/he feels like coming. I can’t dive against the tide or fight against my life force. I can see how my energy is getting depleted. I will keep trying to let go and surrender. FF – So sorry to hear about what is going on. I hope you start to feeling better. MH. You are on a roll. “Baby will come when she/he feels like coming. I can’t dive against the tide or fight against my life force. I can see how my energy is getting depleted. I will keep trying to let go and surrender.” You should have your own thread to post these beautiful “light bulbs” (snowflakes) onto. Everything you are saying is how I’m feeling. Exactly and precisely. And your vulnerability makes me want to hug you. You are so brave. I am proud to be walking on this journey beside you. These are thoughts of the day !!! I can’t believe that two weeks have passed since our last call. I asked Julia to hold me accountable to my practice and this has been very revealing. There is definitely a different feel when you know that someone is going to ask what you have done. I have found that I have built a life with almost no time for myself! I am not sure how I did this but presume that in my search for way to distract myself from the difficult emotional journey that we have been undertaking for the last 9 years. We have been under financial pressure and I work 80 hours per week which is not smart or sustainable. My question of the last few days has been how I make room for our baby? We are progressing down the road towards egg donation and our donor has had her tests and we now wait for the results. If all goes well, we will probably be ready for embryo transfer towards the end of August/beginning of September. How do I prepare in the coming weeks? I am very much looking forward to hearing you later for those on the European Circle. Beautiful poem Ester, thank you so much for sharing with us ! Waiting for the tests to be done on the donor in the upcoming weeks. My faith was stumbling a bit and doubt overshadowed my efforts. The inconceivably fertile next self in gestation is my “faithful, trusting self”. What nutrients is she lacking (does she need)? –> Well she is lacking self confidence, faith and trust on herself, her path on a physical and emotional levels. I am trying few different things to gain her confidence back and develop faith in a way that has never been done. This is more than just for the baby. On an emotional and mental level, I started going to “Mindful meditation” sessions. I am trying to learn and practice “Mindfulness”. I need this more than ever now to maintain my sanity. All of the above is to practice “let go off and to surrender to what is”. This is my main motto. Also religiously practicing imagery is another thing I am doing. I re-heard the intro presentation. I want to be conscious and to be present to for myself. Do I dare to ask for what I need in my relationships with others to usher in this new birth? is the Esther that works 80 hours a week an O, V, or a UM? And if as an O, she is causing you suffering which one of the tools can you use to see and hear and heal her? What is the one insight, one thought that entered your mind, one shadow of an image that landed smack in the most tender place in your heart and forever changed your approach to this journey, and your role as a provider in your family? This practice is about providing us with the tools that support us in living the truth of that poem. Not easy, I know, but it works when we work it. Maybe we can do some of that work in today’s circle. Thank you for your comments. The O is definitely at the wheel much of the time and the blessing of this work is that I can see that now. I will give thought to your question which is at the heart of things (I still don’t know how you do that!). Miracle Hope I can completely understand how you feel. I am focusing so hard on not sabotaging myself and feel that in turn, that is exactly what I am doing. Your motto of surrendering to what is, is beautiful and I would say one of the main messages that I have received from this work – some days I am better at this than on others. It is wonderful to have the support of our community to take us through these journeys and to know that we are not alone. Take care and I look forward to hearing you very shortly. Today I’m working with the Field of Surrender, as my little control orphan has come out a lot lately to play. She likes to get on the internet and Google infertility treatments like crazy (DHEA? Maybe that’ll work for me! Maybe I have an immune system defect? What if…) She analyses, frets, worries, and wonders. I think I need to reread The Fertile Female, because I feel that this will help ground me. Such a good question! I honestly feel like I’m back at square one. I feel pushed back to the beginning of my journey here with Fertile Heart and I don’t even know what a Visionary is much less what she needs. It’s so very frustrating. I hear the Orphans so clearly. Right now my jealousy and panic Orphans are having fights over which one gets to be the loudest. I’m not inspired by pregnancy stories anymore–they fuel my orphans (and my F-it Orphan loves to chime in here) into overdrive. Especially Panic. She LOVES to hear about other people succeeding and living happy lives. I’m not feeing enriched or nourished or even hopeful. My faith is shot. So maybe starting over isn’t such a bad idea. Maybe getting back to basics is what I need. Whenever I’m away from yoga for a long time I like to get back with a level 1 class so I can be reminded of the tools I so knew by heart. Muscle memory kicks in and before I know it, I’m back at it again. Maybe that’s what I need here. Just get back to basics and refill my well, because Lord knows it is dry as a California desert right now. 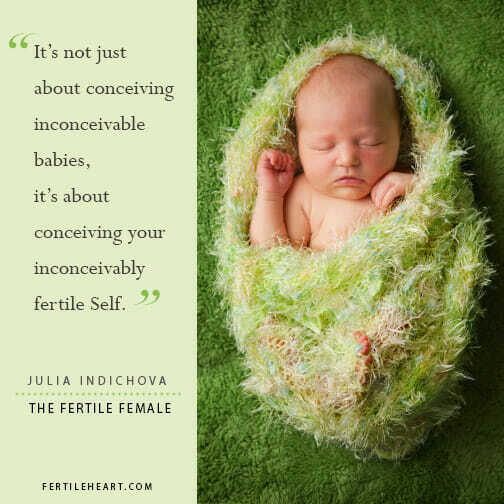 The inconceivably fertile next self which is in gestation is the one who believes that she IS good enough, that her voice DOES count, that she deserves to ALWAYS feel loved, accepted and nurtured, that others’ opinions aren’t paramount. To nurture her to a full term pregnancy she needs plenty of food to thrive- enough protein to help with energy and feeling grounded, and lots of delicious fruit and veg, cooked in new ways to keep her inspired. She needs to remember that by doing things in her own unique way will keep life joyful. In relationships she respects herself, she gives to others but not at the expense of herself. She is not afraid to ask others for help or support. So as I’ve been struggling a lot lately with my embarrassment, shame, and blame orphans, I wanted to post this text from a very good friend of mine who has been supporting with through my entire journey and who is the one friend I consistently open up to and confide in. Thought that was worth sharing. So what do I need to nurture me on my journey? To continue to trust and make myself vulnerable to people like this. Who will heR and accept my orphans. But then will guide them away from the dark places they’ve been hiding. Bailey – your note resonated with me. There is a lot of embarrassment,shame along with a fully grown doubtful mind that asks if pregnancy is ever possible for you? which triggers the fear orphan to run frantically to save herself. I feel the doubt has grown like a bed of weed in my mind. I am determined to remove it from its roots and nourish my mind with courage and trust. your note resonated with me. There is a lot of embarrassment,shame along with a fully grown doubtful mind that asks if pregnancy is ever possible for you? which triggers the fear orphan to run frantically to save herself. I feel the doubt has grown like a bed of weed in my mind. Currently working with “room of fear/doubt” followed by jail break. Thank you all so much for being here. Wonderful ideas, wonderful support!! I love these questions, Julia. Also, am I interrupting or supportive my next Visionary Self? I have been doing Welcome Home Fertile Heart body truth and All of You All of Me Fertile Heart imagery (II). My husband is the one in All of You, etc. because I felt tricked since he seemed to be anxious for kids before marriage, but after a few challenges, not so much – like when are we going to be done idea. He’s a good guy and a good dad. Sometimes I have difficulty in this area. The inconceivably fertile next Robin in gestation is the Robin who does a reasonable amount to help her daughter with more balance and detachment and can nurture herself without guilt regardless of her daughter’s emotional state or grades in school. Like right now I’m trying to limit the number of times during the day that I check my daughter’s grades (last day today) – 3 are borderline passing and not. I have lost sleep over this. It’s sort of like an addiction. I check the computer site too many times a day and this does not fill me with joy. It’s a work in progress. The next inconceivably fertile Self in gestation is the Self-Loving Joanne. This is the Joanne that is mindful of what she puts into and on her body, is compassionate with her Self-directed words, and shows Love to her miraculous, amazing body. The Self-Loving Joanne also has a respect for balance. I will nurture her with exercise, rest, sunshine, smiling in the mirror, meditation, nutritious food, clean water, body truth, healing imagery, and antioxidants. The nutrients I will give her are respect for who she is and daily reminders of her value and importance. What I will ask of others is that they stop telling me to “relax” or to “just adopt and then you’ll get pregnant” or that I “should know when to give up.” If I can learn to ask these things, then maybe I can put down the Golden Shield, and they can see who I really am. Oh my god, you wrote it sooooo well Joanne….I see the Visionary beaming with confidence!! I just wanted to thank you a million times :) !! When Julia asked the question, I was thinking to myself when did I take care of others to be a good girl and thought this question doesn’t resonate with me. But then the way you opened your stmt and responded blew me away. That’s exactly what I kept whining about in the other blog and yes I exactly act and hide my orphan and don’t want to show up as though I am childless, I even hate writing it here. I can instantly feel the constriction in my neck & my orphan shouting “I am not childless”. There is a lot of bitterness in me when I am in the middle of 4-5 pregnant women who kept on talking about their pregnancy. At any cost I don’t want to entertain the childless orphan because I feel it makes me weak, ashamed, dictates me as a failure. I show extreme bitterness towards it. And the same feeling is not allowing me to receive and acknowledge this orphan. a lot more work needs to be done here…”Embracing the patience” is such a powerful statement. I really need to keep clarifying the orphan state patiently.Thanks again !! which inconceivably fertile next Self is in gestation? My V self who is ready to hear the truth from my orphans. No matter what the truth is. It feels so good to be able to see her truth! What nutrients is she lacking (does she need)? Being heard and being understood. I had no idea how much I needed both! Do I dare to ask for what I need in my relationships with others to usher in this new birth? Yes I dare! I want to continue walking towards my child. I feel like I have my child walking towards me too. I was getting goose bumps as I was reading this Julia ! !